China's yuan sank to a 10-year low against the dollar on Monday, coming close to breaking the politically sensitive level of seven to the U.S. currency. 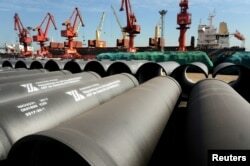 FILE - Steel pipes to be exported are seen at a port in Lianyungang, Jiangsu province, China, May 31, 2018. The yuan, also known as the renminbi, or "people's money," has declined by almost 10 percent against the dollar since April as China's economy cooled and U.S. and Chinese interest rates went in opposite directions. That helps exporters cope with tariffs of up to 25 percent imposed by Trump on billions of dollars of Chinese goods. But it raises the risk of inflaming American complaints about Beijing's trade tactics. 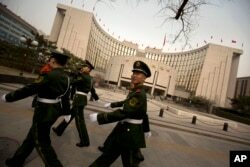 FILE - Chinese paramilitary police march past China's central bank, the People's Bank of China, in Beijing, March 12, 2016.